Okay it’s finally here, my skincare routine! I like to switch up my products quite frequently to see which I love, and which is worth sharing. I cannot tell you how much I love Dr Dennis Gross Skincare line. I’m not being paid to say this either. I love his line and love what he’s created. The science behind it is GENIUS and he’s genius. I’m going to go through each product with you, the reason I use it and what it does for your skin. Keep in mind, everyone has different skin types. He has a quiz on his site that you can check out to see what products would work best for you. I know it’s quite pricey, but its worth investing in. Ever since I started following this routine and using his products, my skin is CLEAR AS DAY. No breakouts, redness gone, more balanced skin tone, brighter eyes, skin, and I feel more confident. I don’t feel like I have to wear any make up. He uses a lot of Vitamin C in his products and what it does for your skin is incredible. Read more about it HERE. Step 4: Apply Step 1 Alpha Beta Peel pads, wait 2 minutes then apply step 2. Step 5: Apply Dr Dennis Gross C Collagen Serum. 2 Pumps all over face. Step 6: Apply Dr Dennis Gross Retinol. 1 drop on both cheeks, chin, nose, 2 on forehead and massage into skin. Step 7: Apply Dr Dennis Gross Alpha Beta Moisturizer all over face and neck. Massage upward. Step 9: (optional) Massage 4 pumps Rose Hip Oil all over face, neck hands and chest. 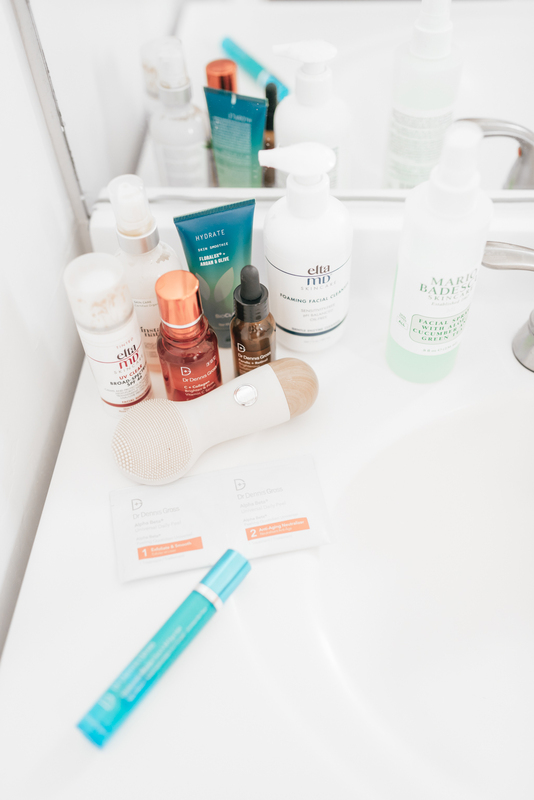 Here is the FULL BREAKDOWN of all the products I use, and WHY. CLEANSE. I wash with Elta Md Cleaser and use the Nion Beauty Brush. Here is a post I did on the NION BEAUTY BRUSHES. I scrub about 1 full pump on about one minute. SPRAY CUCUMBER MIST. Mario Bedeascu. 4 Sprays all over face. PEEL PADS. Damp my face with a dry towel, and then I use the amazing Dr Dennis Gross Alpha Beta Peel Pads. There are 2 steps in this. 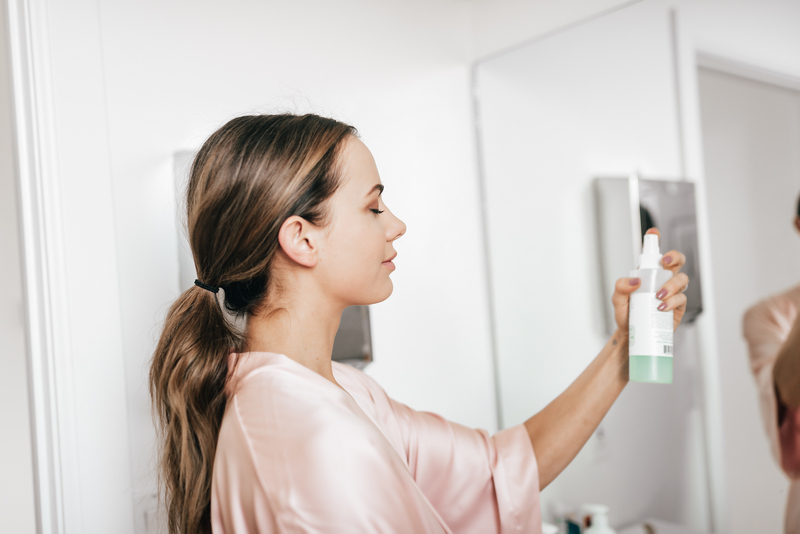 Step 1 is packed with rejuvenating, powerful yet gentle, exfoliating acids, and step 2 controls the alpha hydroxy acid activity and delivers anti-aging actives, nourishing skin, keeping it balanced, smooth, and radiant – perfectly prepped for a more effective skincare routine. 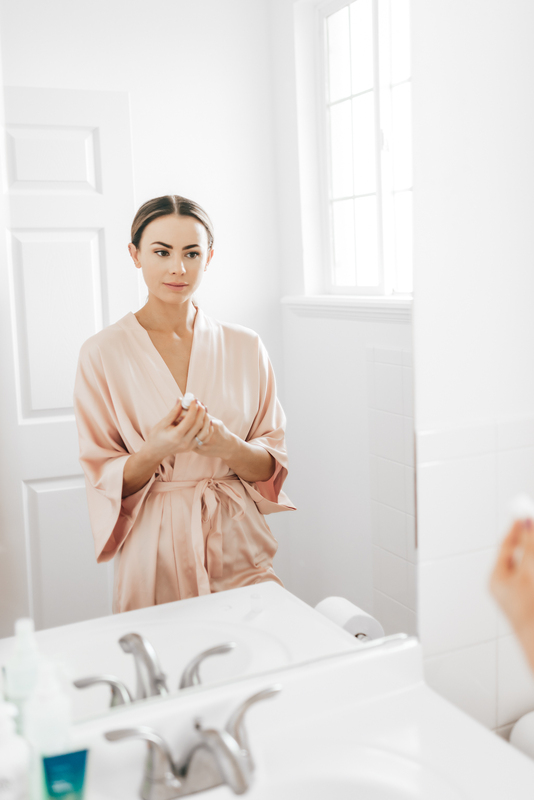 Expect your complexion to appear smoother, with fewer fine lines, a more even tone and texture, and smaller-looking pores. Contains a combination of seven acids, for accelerated results. Swipe step 1 all over your face neck and chest. Neck and chest are optional. Wait 2 minutes then use step 2 doing the same thing. 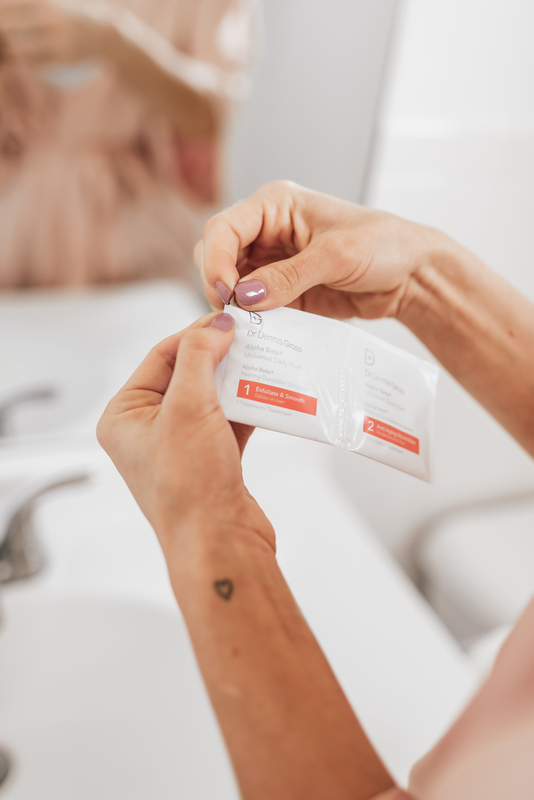 Start with the Universal Peel Pads and then you can move on to Extra Strength. C COLLAGEN SERUM. HOW I APPLY: 2 pumps and gently rub in all over face. Dr Dennis Gross has the best serum. WHAT IS IT? 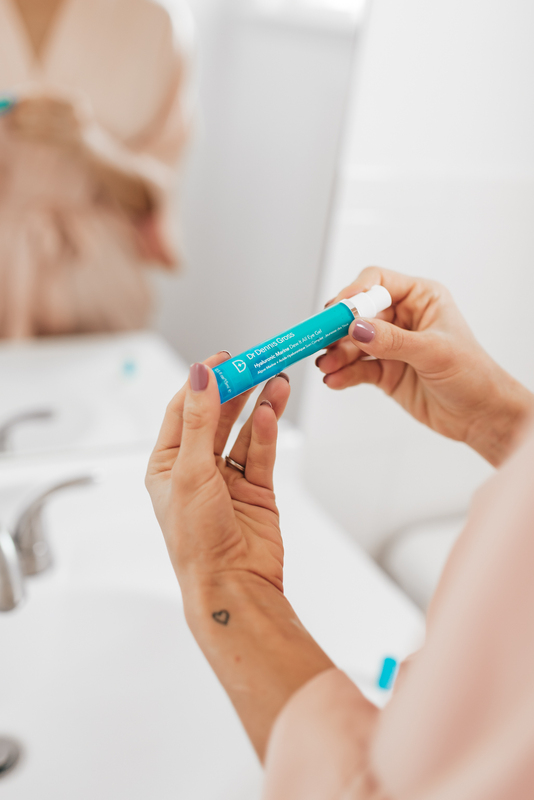 This weightless, fast-absorbing gel-serum is power-packed with our 3-O C vitamin C technology, collagen amino acids, and proprietary energy complex. 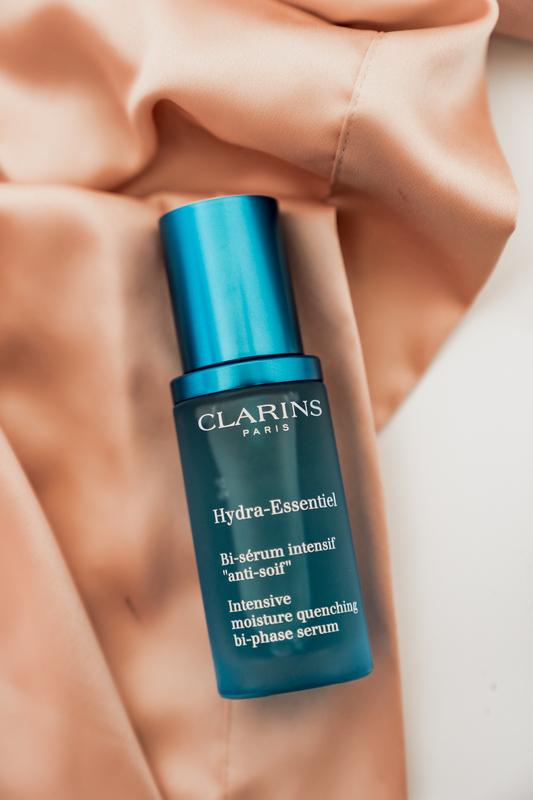 See an instant, reflective brilliance to skin as it works to help improve the appearance of imperfections like dullness, dark spots, rough texture, and expression lines. FOR ME. My skin has less breakouts (if at all) more balanced skin tone, smooth, bright and I feel more confident. RETINOL. HOW I APPLY. Drop 1 drop on cheeks, chin, nose, and forehead, then massage into skin. WHAT IS IT? A fast-absorbing liquid retinol serum supercharged by ferulic acid to help improve the appearance of skin tone, texture, and fine lines for an even, instantly-smoother looking, lit-from-within glow. APPLY MOISTURIZER. I apply either Bioclarity Hydrate, or Alpha Beta Exfoliating Moisturizer by Dr Dennis Gross, which I just recently started using and LOVE. EYE GEL. Apply 1 pump Dr Dennis Gross Dew it all Gel. 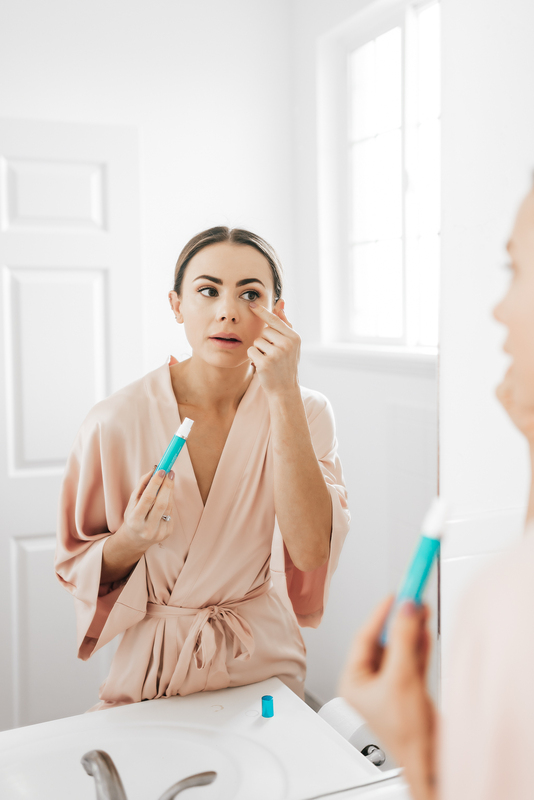 a smart targeted delivery system that solves clashing under-eye concerns simultaneously–puffiness and dry fine lines. Moisture-attracting Hyaluronic Acid and elasticity-building Japanese “Green Caviar” algae provide line-filling hydration at the surface and improve skin suppleness. Caffeine, Carribean Gargonian Extract, and Sarsaparilla Root work synergistically to improve the appearance of dark circles and puffiness by reducing water retention under the surface. Bonus optical diffusers add luminosity. What I’ve noticed, is my eyes never look tired, no puffiness, bright eyes and my eye wrinkles are diminishing. Lastly, I massage 3-4 drops of Rose Hip Oil on my skin, hands neck and chest. I always massage upward and not down. Step 3: Apply Dr Dennis Gross C Collagen Serum. 2 Pumps all over face. Step 4: Apply Dr Dennis Gross Retinol. 1 drop on both cheeks, chin, nose, 2 on forehead and massage into skin. Step 5: Apply Dr Dennis Gross Alpha Beta Moisturizer all over face and neck. Massage upward. Step 6: Apply Elta Md UV Clear Tinted Sunscreen. READ WHY I’M A FREAK ABOUT SUNSCREEN. I’ve never found a better sunscreen for my face. I apply all over my face, neck, chest and hands. Step 7: (optional) Dab 2 pumps Rose Hip Oil all over face, neck hands and chest. And there you have it, my full skincare routine every single day. Here is the thing about me. I LOVE skin. It starts with SKIN. You wear it everyday, you put make up on it everyday. Your make up will actually look better because of it. If you want great skin that is, and want to prevent premature aging. We all are going to age, its inevitable, but don’t you want to slow down that aging process and stay ahead of the game? The great thing is, is that we have the products now to take care of our skin! Think about when our moms grew up, all they had was ponds to remove their make up, and then they were thinking about face lifts at agae 40-50. We have so many things to care for our skin now, we gotta take advantage, right! Its right at our finger tips, and is so easy. We don’t need face lifts in the future, because all we have to do is take 10 minutes everyday, to prevent that from happening when we turn 40. Don’t wait until you have a problem to fix the problem, thats when it looks overdone. I always follow preventative measures. That is why I’ll never ever look overdone, or to much of something. I want to look natural always. Here are the 3 biggest tips I follow. I’m just going to go ahead and CAPS these for you, because they’re so important. In order to have great skin, you must follow a SKINCARE REGIMEN and BE CONSISTENT with it. Day in and day out. If you just take 10 minutes a day to take care of your skin, you’ll be SO amazed at your results. Everyone has 10 minutes. DON’T GO TO BED WITH MAKE UP ON. Thats a huge NO NO. Hope you loved this post! Let me know if you have any questions about any of the products. Happy to answer!